We find ourselves constantly bombarded with offers of low interest car finance; on television, in newspaper advertising and through word of mouth recommendations from our colleagues, friends and family. However, consider the age-old saying; if it sounds too good to be true, it probably is. When you sit down and crunch the numbers, low interest car loans often do not add up to be a better deal over time. Here are just a few of the reasons why. Unfortunately, a low interest package can mean that you quickly lose the ability to negotiate with the dealer, and you may pay thousands more on the purchase price, than if you had shopped around. It’s very easy to be suckered in by that smooth talking sales man, who appears to be offering thousands of dollars worth of savings in the form of low-interest repayments for your dream Hilux. But when it comes to Mr. Smooth, you can be sure of just one thing; everything is calculated. He knows exactly what limits he can go down to, and it’s often not to your benefit. He knows that if he offers you a low finance loan of X percent, but the car at a purchase price of no lower than X, he will quickly make up for the additional dollars he lost in the low-interest payment scheme. That $9,000 extra that you paid for the car quickly outweighs your .5% saving on interest repayments. Is that deal on your dream Hilux as good as it sounds? Low interest payment schemes will be offered on very strict terms. As well as being offered for a non-negotiable, set length of time, they will often exclude sale prices, including EOFY specials, or end of model clearances. They can also mean that you will receive only a minimal trade in amount for your existing vehicle, to help make up the gap. When you start doing the numbers, it’s suddenly not adding up. Savings up front, can mean dire consequences at the end. In order not to stretch the monthly household budget too much, it can tempting to opt for a bigger balloon payment. This in itself can put massive pressure on families to come up with such a large, lump sum payment. A car’s value can depreciate incredibly quickly, with some 2011 Australian car models already being worth only 55-60% of their original value (canstar.com). Being left with a huge balloon payment at the end of a three year lease, for a car that is essentially worth nothing, can quickly turn the whole experience into a nightmare. If you can’t come up with the cash, your options are them limited to trading in the car at what can be a minimal rate, or rolling into another loan which may not offer you the best deal. Suddenly, low-interest doesn’t sound so good. 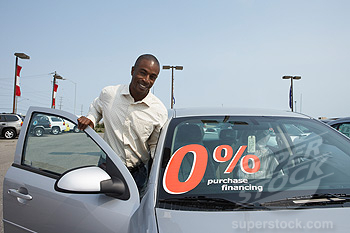 Contrary to popular thought, a low interest car loan may not be the best option. Do your research, crunch your numbers carefully and don’t hesitate to seek advice from a third party.